1.) Since I will be at all the races on the u16 calendar this season (God willing), I think the best way I can help the u14/16 racers is to show up in the Wax Room every Race Day- and in Sun Peaks camp for about an hour. I will be happy to help with any technical tasks at that time. Expect to hear the exact time at the Team Meeting at each race. 3.) Drop me a note or call. I can answer some tuning and waxing questions pretty quickly. Although I must warn you that I cannot multi-task, so on the phone sometimes it may take me a few moments to mentally shift gears and be of much help. Keep doing your Snow Dances. I am hoping to ski by Halloween! Hey Gadget here, back from shooting video at Hood. Do you have a Sprongo account yet? www.sprongo.com IF you do NOT have an account and you have a racer in CMAC, please ask me or another coach. We will "invite" onto our team site. If you try independently, it is really easy to grab the wrong team. CMAC has embraced online video, and we create and post up to several HUNDRED videos every week (during the peak of the season). As of this writing, there are over 12,000 videos already on our Team Site. IF you have a CMAC racer in your family, GET A SPRONGO ACCOUNT!!! You can watch your racer race and train from anywhere in the world with an internet connection... ANY TIME!! Tuesday Wax Night: Coming to a neighborhood near you. I am planning to open my shop up for 2 hours a week for kids and parents u12 and up... and I might make an exception for a really On Fire U10 or two. 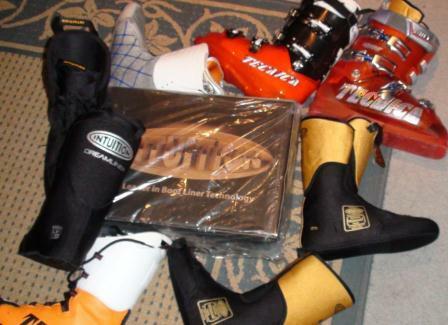 I want to help KIDS learn to tune and repair skis and boots... I will not show parents very much at these sessions. I have 3 benches with vices, plenty of tools and wax, and I even a hotbox to get those race boards FAST!! Did I mention this is a FREE service and that we will have Ski Movies (of some sort) playing?! More info coming soon... ish. I have developed a few unique boot tuning tools and techniques. I won't post too much about them here, but if you have an interest in optimizing boot settings/tuning, drop me a note. You probably don't think of Gadget as a Boot Guy, but I play with them almost as much as skis. 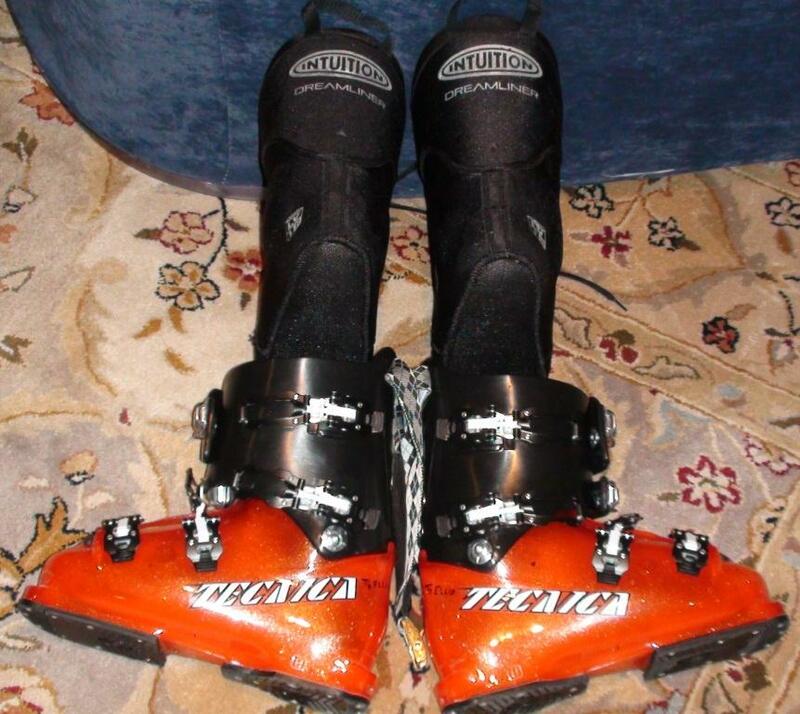 Boots are even MORE critical than skis (or ski tuning), and most people only do the very basics with regards to fit, flex, function, stance, alignment, canting, ramp angle, and elasticity/responsiveness. This is WAY too big of a topic for me to dive into without sufficient interest in the blogosphere, but I will try to gauge interest based on the email and/or comments on this site. I don't wish to bite off more than I can chew however- so let me know what you want/need, and I will go from there. Short Plug- 2 companies have help me a TON with boots in last few years, Tecnica and Intuition. Tecnica has developed some great boots, but especially has a very supportive race-rep Dave Glotzer. And support after the sale is more important than the sale itself- in my book. Intuition has developed a line of great products that solve a lot of warmth and fit issues. Crystal at Intuition has also given me world class support. I am shocked that I don't see more Intuition liners in race boots. Maybe people are scared to try something new. Especially with the new lace up and plug liners, DON'T BE SCARED, INTUITION MAKES GREAT RACE LINERS!! So for those of you experienced tuners who want MORE performance- I'm going to draw back the curtain a little bit on some more tricks. NOT everything at once, and these should not be used until you have a really good BASE of experience. Otherwise, these are like 12" of light powder over rocks: NOT good. * Have (and know how to use) files, stones, side and base guides, a range of brushes and waxes, base repair tools, etc. A fairly complete tool kit and a good understanding of their use. * ways to spend MUCH more money on tools. I am always good for THAT one! So dive it... and if you like it and want even more, by all means WRITE!! I MIGHT even read your email! I have a saying about High End Tuning: "Everything changes Everything ELSE!" There are SO many variables to play with/ get confused with. So, after that teaser, let's talk about individualized tuning. A good carpenter measures twice and cuts once, right? Most good artists and musicians have some idea what they want to create before they start. High end tuning is the same. You must have a goal in mind, an idea of what is standing between you and that goal, and an idea of where you are, and an idea of where your goal is- otherwise, you are shooting in the dark. AND you must work extremely precisely- as imprecision will spoil a tune. So individualized tuning typically starts with video, coach feedback, and/or timing. As skiers get to a higher and higher level, they generally begin to know what certain tuning settings feel like and will be able to provide feedback directly- (USSA Phase 4 and 5 athletes). So, if you want to help your athlete bump to the next level, ask their coach for some feedback on their equipment setup. Not all coaches are comfortable in this area. Some coaches are experts in technique and tactics but don't consider themselves geeky enough to dive into hardware questions. THAT IS NOT A NEGATIVE- We all have our areas of expertise, nobody can know everything. If you don't get an answer you are comfortable with, take some video to another coach that you know and see what they have to say. Individualized tuning MAY involve changing base and or side edge bevels, changing edge finish, changing base structure/finish, binding mount, lifters, or even plate tuning. I am sure I have raised more questions than I have given answers... BUT THAT IS MY POINT!! DO NOT just jump into individualized tuning without a plan or direction. But WITH a plan and a decent level of skill, all KINDS of performance improvements are possible. And once optimized, the ski setup becomes nearly magical. Faster, smoother, more powerful etc. "Back in the day," we structured with sandpaper- roughing up the bases and creating drain paths for melt-water. Then came Riller- Bars, then came hand-stones. Shops used belt sanders, then moved to stone grinders- and sometimes computer controlled stone grinders. Advanced structuring is sort of the Marty McFly school of tuning: Back To The Future. To be prepared to deal with this eventuality, you might as well learn to hand-structure when there is no pressure. Hand Structuring is one of the techniques I am happy to show tuners in person... but online is just too risky. 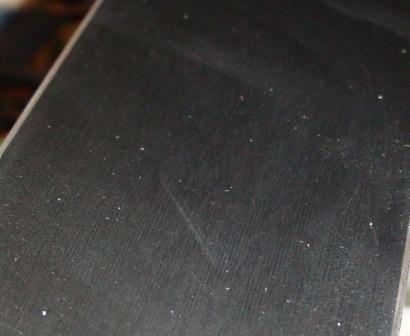 1/07/13: I have decided to NOT discuss base polishing here at this time. I would rather demonstrate the techniques/tools involved in person as it is possible to make the skis worse (instead of better) unless the skill and experience level is quite high. 1/07/13: This is another subject for in-person instruction. I MAY demonstrate base repair 01/12/13, IF time allows. 01/07/13: Yes, edge polish is considered critical for speed skis. No, it isn't well understood by most shade-tree tuners. There are several ways to skin this particular cat. But it really is best to explain it in person- with several skis, tools, magnifying glass etc. I have an idea: These bubbles prove the DEEP WAXING theory of hotboxing. They show entrapped air- which I believe escaped from the pores of the base. Why are the bubbles visible? Because I run my hotbox at an unconventionally low temperature... therefore the wax was semi-solid, not liquid. If liquid, these bubbles would have popped. Also: on pass 3 and 4 through the hotbox, I have been trying something I call "reverse hot boxing." Ray from Alpine Ski Tuning postulated that the warm wax was actually trapping some hot air in the ski, which made saturation more difficult. I decided to try prepping the ski completely, then throwing it in the box for an hour before waxing, then returning to the box. The results are quite good. 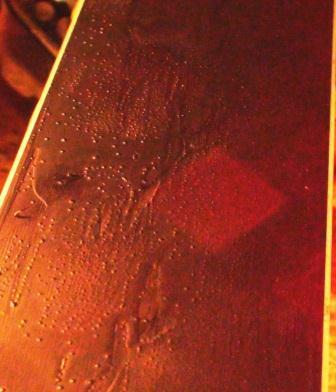 I have NOT yet proven whether more or less wax is actually being absorbed, as I will only be able to do that be waxing 2 identical skis by both methods and weighing them after the experiment... but I WILL get to that at some point.